God created preschoolers full of imagination and curiosity. They have an exciting world at their fingertips ready to explore. 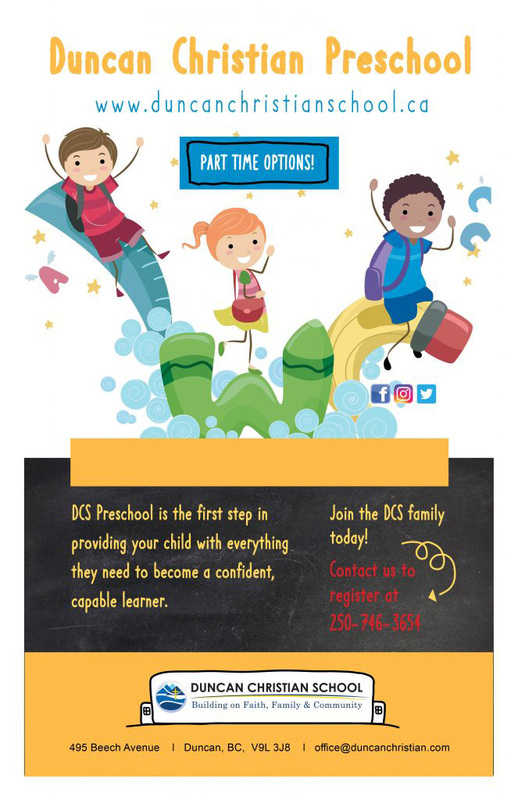 Our aim at Duncan Christian Preschool is to offer an enriched, safe and stimulating environment that recognizes the God-given uniqueness of each child and allows them to explore and develop a love for learning. As the saying goes, play is a child’s work and the classroom is his/her laboratory. Through play and various activities, including music and movement, creative art, games, field trips, stories, outdoor play, Bible time and quiet time; your child will be given the wonderful opportunity to develop his/her God given gifts and talents in all areas of learning; including social, emotional, spiritual, cognitive, and physical. Beginning preschool is an important step in your child’s life. Every child is unique with special needs, interests, and characteristics. We look forward to partnering with you to help your child grow, learn and develop, both as an individual and as a member of our community. We look forward to sharing many fun and meaningful experiences with you and your child. Duncan Christian Preschool is a play based program which focuses on exploration, discovery and creativity. Social development is a very important part of your child’s emotional growth and preschool is a gentle introduction and transition into this social playground. We foster social development through free play time, discussion time at circle, drama, show and tell and special helper. Our art, math, science and circle curriculum is based on themes throughout the year, with many opportunities for the children to express themselves creatively. We focus on process rather than product, what your child brings home from preschool may not look like a finished project to you, but it’s something they have worked very hard on and will be very proud of. Minimum required age for admission – 3 years by end of December. Children must be completely toilet trained. Mrs. Darlene Brandsma directs and teaches our preschool program. She is an experienced preschool teacher and is highly regarded by students and families. Our staff/child ratio is in line with regulations from the Community Care Facilities Licensing Act. Our preschool teacher is licensed to practice in BC as an Early Childhood Educator. Preschool teachers are required to submit a criminal record check.